This is an elegant treatment for the good old chicken leg, as festive as a sautéed chicken breast but cheaper and more laborious. It's luxuriously boneless, with browned, crispy skin and deeply flavored meat. 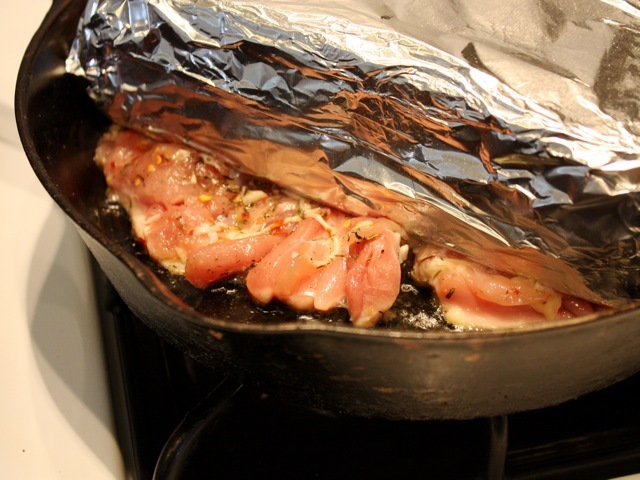 The aluminum foil-wrapped brick is not heated, but its weight helps the meat to cook rapidly, the fat to render, and the skin to crisp. Serve with Parmesan polenta and vegetables of the season. "Chicken leg" denotes the entire leg: the drumstick and the thigh, still attached to one another. One large chicken leg is enough for a serving. You may also use thighs, allowing two per serving; see the variation below for skinless thighs. Perhaps you have the good fortune to know a butcher who will expertly bone the chicken legs but keep the skin on for you. More probably, you will have to bone the legs yourself. Wrap the bricks in two layers of aluminum foil, shiny side facing out. Make sure there is a clean, seamless side to each one. Bone, but don't skin, the chicken legs. (Warning: This procedure offers many opportunities for poking and cutting oneself — be very careful and always point the knife toward the surface of the cutting board, not your fingers.) Put a leg on a clean cutting board, skin side down. First, visually and with your fingers, locate the bones, then make a cut along their length with a boning knife or a small, sharp knife. Keep making shallow cuts along the bone and around the joint until the bone is separated from the meat, trying to avoid piercing the skin. It's fine if the meat is not too neat-looking; rips or shreds will be hidden in the cooking. Repeat with the remaining legs. Season the chicken with the salt, garlic, thyme, black pepper to taste, red pepper flakes, and 1 teaspoon olive oil. Let marinate, covered, for an hour, turning the pieces a few times. Heat a large, heavy skillet over a medium flame for several minutes. Lightly brush the clean side of each brick with olive oil, and drizzle a little oil into the skillet. Pat the skin side of the chicken dry with paper towels. Lay two of the legs, skin side down, in the hot skillet (they should sizzle happily), and place the two bricks on top, weighting the chicken down. When the skin is golden brown and crisp, after about two minutes, the legs are ready to turn. Cook on the other side, without the brick, for about two more minutes. Cook the remaining two pieces of chicken in the same manner. Serve immediately, while the skin is still crisp. Bacon-Wrapped Chicken Cooked Under a Brick: In a hurry, and have only boneless, skinless chicken thighs available? Just replace the crispy fat of chicken skin with the crispy fat of bacon. Using six boneless, skinless thighs and a lighter hand with the salt, carefully wrap a thin strip of bacon (cheaper bacon is usually thinner) around each marinated, seasoned thigh, and cook as directed above. The bacon will render its fat and become crisp during the cooking.